QlikView has more than just a pretty face, there is some truly innovative, and very useful technology on offer here. The company talks of maintaining associations between data, and this facilitates a much more flexible approach to data exploration and visualization. In practice what this means is that users can search available data resources with the knowledge that any relevant items will be retrieved, no matter how disjoint the origins of the various data items. In a way it is almost a merging of enterprise search with BI – something I talked about several years ago. The QlikView Business Discovery Platform provides an enterprise wide solution to the need for information. It embraces IT (instead of alienating it), business users and analysts. This is comprised of three main components – the QlikView Server, QlikView Publisher and QlikView Desktop. QlikView Desktop is where the associations between data items are established and where the user interface is laid out for QlikView Apps. An SQL like scripting language is used to create associations for use by business users and analysts. QlikView Server is the engine of the architecture where in-memory processing takes place and where issues such as security are addressed. It also handles communication with clients (web browsers, mobile or desktop) and includes a web server, although Microsoft IIS can also be used. 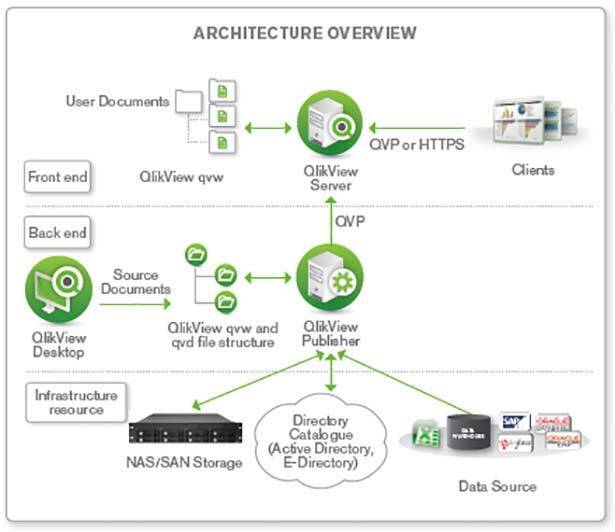 QlikView Publisher loads data from the various defined data sources and distributes documents to the QlickView Server(s) for consumption by users. Because the users generate their own reports and visualizations IT is left to get on with addressing the infrastructure issues associated with BI, including security, capacity, governance and systems management. The analyst typically uses QlikView Desktop to create the data models users will need. Meanwhile business users are presented with an environment where the data can be viewed as a unified whole, where a rich visualization environment is provided and where needed, QlikView supports extensive collaboration features. QlikView has clearly thought the whole thing out both conceptually and practically. The net result is that every function in the organization should get what it wants. This is a different, and potentially much more productive, approach to BI. The capability does not extend to data mining or other forms of analytics, and it doesn’t pretend to. The scripting language provides ample means to create highly bespoke solutions to individual organization needs, and as a BI tool it should not run into any dead-ends. QlikView is certainly worthy of serious consideration.